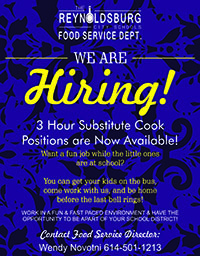 The Reynoldsburg City School District is looking for substitute cooks for the 2018-19 school year. Do you enjoy being around kids? Do you enjoy being in the kitchen and working in a fast-paced environment? Are you looking to work hours that allow you to take your kids to school and pick them up? Are you looking for a job that has the same schedule as your kids and you can enjoy holidays and summer break with them? If you answered yes to these questions, this job is for you! We would love for you to be a part of the Reynoldsburg City Schools Food Service department! If you have any questions or would like additional information, please contact Wendy Novotni at 614-501-1213. If you're ready to join our team, complete the following application and return it to the Food Service Office at 1555 Graham Road.